I was on my way to Causeway Bay to meet Hello Kitty for lunch when she suggested that we check out Jamie's Italian. Neither of us have actually been there since the place opened last year. It was never high on my list of priorities, and there was the issue of long lines in the months after opening. Since I don't have that famous mythical "food writer's card" that someone waved to skip the long lines, I simply didn't go. We were going for a late lunch, and since many months have passed and they've actually opened a second location across the harbor, I figured there wouldn't be any lines now. I was right. Our server brought us the menus, which included a "Sustainable Seafood Week Menu". Since I do try to be more environmentally conscious, and do carry a copy of the World Wildlife Fund's Sustainable Seafood Guide, I decided to order two dishes off this particular menu. Smoked mackerel bruschetta - I was a little bit surprised that this came on one single piece of hard focaccia, but meant I had to cut it myself before eating or sharing. The fennel didn't seem to carry much flavor on its own, but thankfully the ricotta was nice, and the mackerel did deliver good, smoky flavors. Crab tagliolini - the kick from the chili was surprisingly strong, and kinda overwhelmed the flavors of the crab meat, but at least the texture was good. A shame that the tagliolini was a tad overcooked and limp. Tagliatelle bolognese - this was much better. The tagliatelle was more al dente, and the ragù rich with the flavors of Chianti. Epic brownie - I'm not a brownie connoisseur, but I'm not a fan of this. This was like one of those flourless cakes that just tasted like a mouthful of dry powder... and there ain't nothin' "fudgy" about it - despite what the menu claims. This HAD to be taken with the gelato or you'd be gulping down water to wash the powder off your tongue. There wasn't nearly enough sauce, either. But at least the caramelized popcorn was good... and the only saving grace here. I didn't come here with any expectations, and I guess the price point was low enough that there wasn't much to complain about. Other than the brownie, the savory dishes we had were decent. But the "sustainability" bit pushed a button here... While I applaud Jamie's for sourcing sustainable seafood, it is sad that all the sustainable seafood came from Ireland or Denmark - which meant that they were shipped a long way from home, and thus had a reasonable carbon footprint. 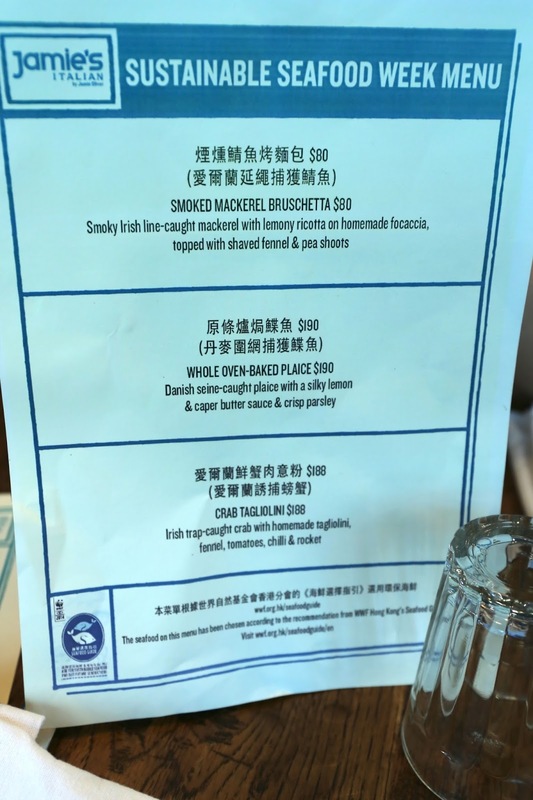 Here in Hong Kong we pride ourselves in the availability of seafood, and it's a shame that Jamie's was unable to source their sustainable seafood locally. Was that not an option? I guess we still have a long way to go.